On January 17, 2019, The Texas Tribune published a story about groundwater contamination in Texas caused by the negligent storage of coal ash. Coal ash is what’s left after coal is burned at power plants. Coal ash has to be stored safely to prevent leeching and seepage. According to the story, groundwater is contaminated at all of the 16 power plants in Texas which were studied. This includes the Texas Municipal Power Agency (TMPA) power plant at Gibbons Creek near Carlos, the power plant in Fayette County near La Grange and a power plant in Robertson County. The contaminants include arsenic, cobalt, manganese, molybdenum, nickel, selenium, boron, and sulfate. In 2015, the Obama Administration created the Coal Ash Rule which strengthened regulations concerning the storage of coal ash and required power plants to report groundwater monitoring data to the Environmental Protection Agency (EPA). Needless to say, the Trump Administration has proposed weakening the rule. In some instances, groundwater contamination was found that is 100 times higher than safe levels. 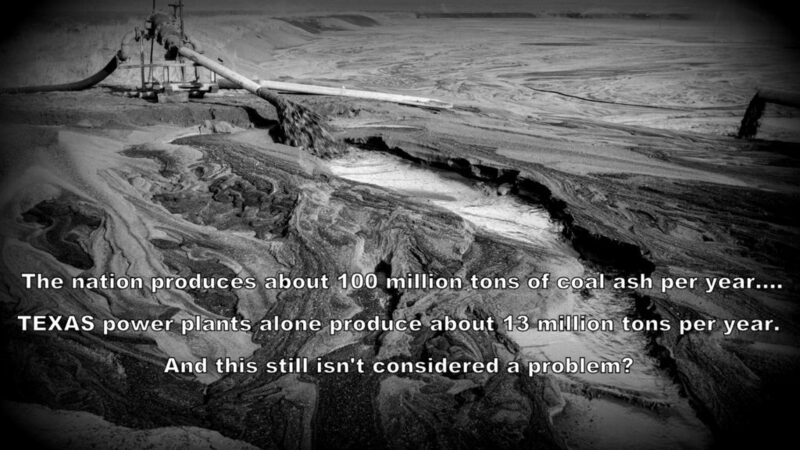 The nation produces about 100 million tons of coal ash per year. Texas power plants produce about 13 million tons per year.